This Google Maps mashup can show you some handy tips from Foursquare. Foursquare Tips detects your current location and loads tips from the location sharing site for businesses in your current vicinity. 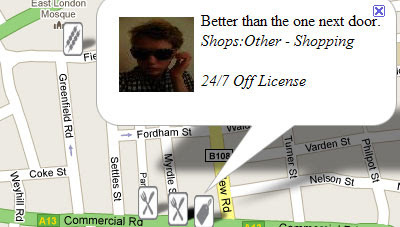 The map uses categorised map markers to show you recommended shops, bars and restaurants. If you wish to view Foursquare Tips for a different location just pan the map and the tips will update automatically to reflect the current map view.